June 28, 2013 – River Mangrove Are The Life Of Climate.IS. Effects of climate changeE: the small size of the fish was not water calanabile wive! 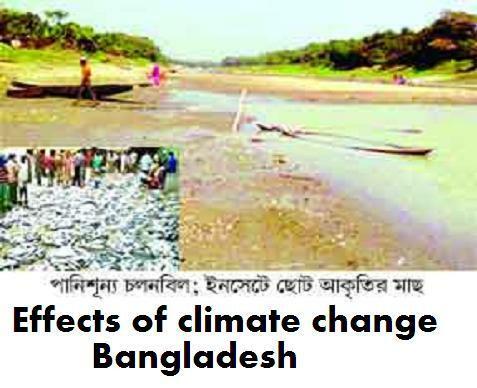 Jhinaigati (Sherpur): According to environmentalists, the adverse effects of climate change may be due to the small size of the fish are maturing. This is the ultimate source of food is threatened. Britain’s Royal Society journal biology letters the name of the results of this study have been published. In the previous studies, some important species of fish to catch the big fish selectively and help the environment changes, the effects of food Ease the shape of small fish started. However, if the size of the extent of the impact will be, or how small, they still have not been investigated. Australian and Finnish researchers examined this issue for the group is to support high-capacity computers. What is going on in our country related research – or was not – you do not know it, but because of climate change are already jhinaigatira all kinds of small fish. Above the average of the five species of fish that are smaller than the size of the next 50 years, we examined the effect of his comments are. The fishing was great to see the impact of the research team. They see that the five most important species from the total amount of organic mass is reduced 35 percent. With the amount of fishing that they can find samaparimane get reduced. According to the research group, the fish’s body shape is slightly reduced, but the effect of natural death. The more, the world is a sea change in the environment. The change happening in the way. The changes are happening in the world of fishing and being warm through. However, the fish can be protected from this condition, it is a comprehensive study of the run. The team of researchers from the adverse environment of widespread public awareness of the need. Bisbajalabayu damages will change people in the world. Negative effects on fish for human societies has been identified as a significant risk. Tarasa (Sirajganj): calanabilancale effects of climate change have been read. The bottom water bill is madhyaasarheo. Monsoon in the range of jalarasi calanabilera mathaghata were submerged. Depending on the water bill calanabilera tarasa, Ullapara, sahajadapura, chatmohar, bhangura, Faridpur, gurudasapura, sinra and atrai winter stocking of millions of farmers, fishermen and fish prey was busy. Marine transportation – to bring the goods – would be taken. Life depends on water bills – had to change professions. But most of the time calanabile Monsoon fetch water in the region has chandapatana people’s lives. Calanabilera mathaghata boat traffic in panisunya bill because of the movement of pedestrians hemtei. This is because water is not matsyajibira aside. It tells pesai change.